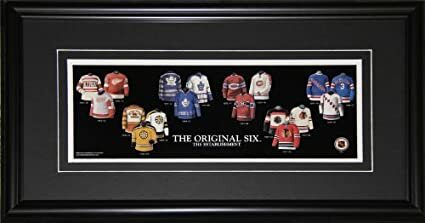 Lithograph print featuring the Evolution of the Original Six jersey's. Comes matted and framed. Comes ready to hang on your wall in your home or office! Each frame is hand crafted using state of the art machinery. Please note all actual photographs, pins, and plaques in the frames may vary due to availability. We will strive to make items exactly as pictured, however if there is a need for the identical item, please contact us first to ensure customer satisfaction.